Set of 20 1-10mm Bamboo Crochet Hook Handle DIY Wooden knitting needle with case. Crochet knitting needles feel smooth in your hands. 12 bamboo needles, sizes 3mm, 3.5mm, 4mm, 4.5mm, 5mm, 5.5mm, 6mm, 6.5m, 7mm, 8mm, 9mm, 10mm. CIRCULAR BAMBOO KNITTING NEEDLES. LENGTH APPROX 80cms. CHOICE OF SIZES. 12 x Professional Carbonized Bamboo Crochet Hook Knitting Needles in Different Sizes (3.0mm to 10.0mm). A set of 12pc Professional crochet hooks in 12 different sizes, made of durable carbonized bamboo material and is for knitting Sweaters, lace etc. List of products: 36 Knit Needles. Material: Bamboo. We'd like to settle any problem in a friendly manner. Usage: you can knit sweaters, knitted pants, scarves, collars, hats and so on. We want to make sure you are happy with our item. You can not just arrive and browse our ranges or request to buy products. Collection is available from our location BUT There are three ways this can be accomplished. 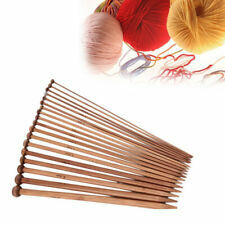 One set of 14 different size bamboo circular knitting needles. Nice needles with smooth finish, perfect needle points and joints. The more you knit with them, the more you will love to knit. 14x bamboo circular knitting needles in the following different sizes: 2.0mm, 2.5mm, 3.0mm, 3.5mm, 4.0mm, 4.5mm, 5.0mm, 5.5mm, 6.0mm, 6.5mm, 7.0mm, 8.0mm, 9.0mm and 10.0mm. Crochet knitting needles feel smooth in your hands. Includes 20 individual bamboo crochet hooks to fulfill different needs. 1 x 20 PCS BAMBOO CROCHET HOOK SET. 12 bamboo needles, sizes 3mm, 3.5mm, 4mm, 4.5mm, 5mm, 5.5mm, 6mm, 6.5m, 7mm, 8mm, 9mm, 10mm. Material: Bamboo needle and plastic tube. Get images that. make Supersized seem small. Quantity: 18different sizes, 2 needles for each size, Total 36 needles. Material: carbonize Bamboo. Type: Single Pointed end. Crochet hook made with premium Chinese bamboo, one of the strongest and largest bamboo species in the world. Bamboo is warm to the touch and provides a smooth yarn feed. Perfect for those projects using chunky yarn. 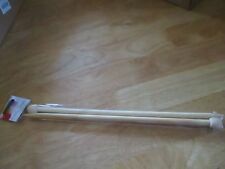 Essentials Knitting Needles 10mm.30cm long. Condition is New. Dispatched with Royal Mail 2nd Class Large Letter. The total length of the needles ( including needles and cord) is approx. The size of the needles is 10mm, US15 or UK000. Perfect for knitting the yarns with high durability. It’s a perfect gift for anyone who is interested in knitting. Needle is made from carbonized bamboo. It’s made of carbonized bamboo. You can comfortably hold them in hand. Pony Bamboo Circular Knitting Needles. The needles are new and unused.